Pinal Creek Canyon is a remote backcountry destination, located in the Salt River Canyon Wilderness within the Tonto National Forest. 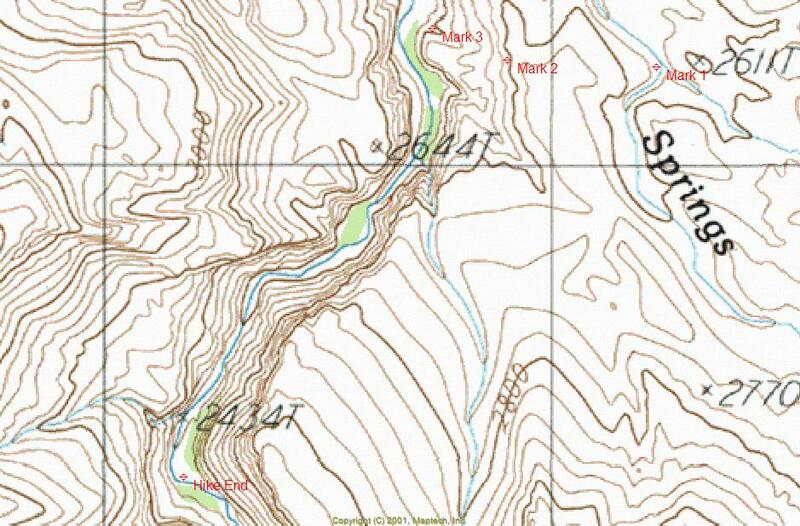 The topo map name for this area is "Salt River Peak". The Salt River Canyon Wilderness covers about 32,000 acres of wild and remote, rugged desert landscape that rarely sees any visitors. If you appreciate solitude and have a true love for backcountry adventure, this hike will likely satisfy your appetite. Along this hike you will be treated to a broad mix of low desert vegetation, lush riparian areas, rugged geology, and diverse wildlife. This area typically receives consistent rain levels throughout the year contributing to rich and healthy flora. It is very important for anyone considering this hike to know that the Pinal Creek Canyon segment of this trip involves heavy bushwhacking, constant boulder hopping and required wading through one stretch of the creek. This hike is not for the easily frustrated. If you're a backcountry junky like me, with an unquenchable thirst for adventure, you will be right at home. Now that the disclaimer has been handled, lets get to the fun stuff!! The hike as posted starts out near the end of FR223. You will find a parking area at the bottom of a hill, within a small valley. From the parking area, walk up a short hill along a jeep road heading to the north and then follow that road down to Shute Springs. From the spring you will go through a rusty metal gate to the east and follow a fairly obvious pack trail to the bottom of Shute Springs Creek ("Mark 1", Lat. 33 degrees/35'/46.53"/N & Long. 110 degrees/52'/39.72"/W). There is a cairn at the bottom of the trail that is important to note for your return route. The pack trail heading back up to Shute Springs is difficult to see from the sand wash. The sand wash that you are standing in is the route that you will be following down to Pinal Creek Canyon. Just a short way down from the pack trail you will come across the riparian area of Lower Shute Springs at the intersect point of a steep, extremely rugged canyon that heads back up towards the trailhead (Lat. 33 degrees/35'/55.83"/N & 110 degrees/53'/00.93"/W). It is possible to hike up this canyon back to the trailhead, but I can't emphasize enough that it is a very nasty route. Dont say that I didn't warn you. To walk through this riparian area you will want to stay on the left side. Initially you will be crossing a mountain of huge boulders that have been violently pushed down the canyon mentioned above. Just beyond the boulder segment you will be walking along a solid rock shelf that follows the edge of the trees just above the water. Once you're through the riparian area, things get much easier. For the next 1.75 miles you will be continuing along the sand wash of Shute Springs Creek. Along this segment you will find very interesting rock formations and bluffs. After roughly 1.75 miles of easy walking you will now come up to a obvious and significant sand wash on your right that intersects the route that you are following ("Mark 2" Lat. 33 degrees/36'/19.43"/N & Long. 110 degrees/54'/03.97"/W). This location is where you will now head west out of the Shute Springs Creek sand wash to access Pinal Creek Canyon. From here you will climb up and over a moderate hill to the start of a game trail ("Mark 3" Lat. 33 degrees/36'/19.94"/N & Long. 110 degrees/54'/16.94"/W) that drops down a steep draw into the bottom of Pinal Creek ("Mark 4" 33 degrees/36'/22.22"/N & Long. 110 degrees/54'/23.45"/W). Take very good mental note of the canyon and overall landscape. 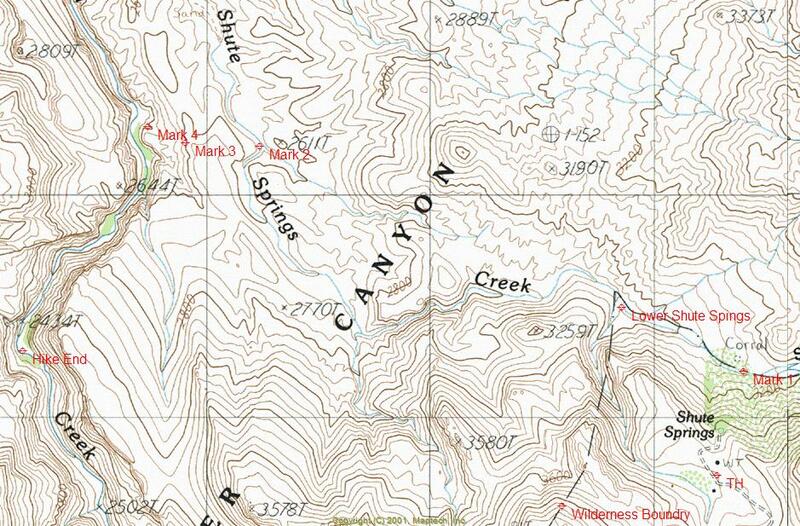 Besides the route that I have described, there are no other ways in or out of the canyon. If your reaction is anything like mine, your jaw will drop to ground when you see the view of what's to come. Before me was a stunning hidden riparian canyon with steep and sheer cliffs on both sides. The segment of Pinal Creek that I explored is a protected one-mile stretch of lush vegetation that is somewhat opened up, when compared to the narrow gorge that is above and below the location. It's hard to believe that this is the same Pinal Creek that only four miles up-stream is nothing more than a broad dry sand wash within the Globe city limits. Now for the messy part. If more than two people beside myself have explored this canyon in the last twenty years, I would be surprised. The route up the canyon, besides being riddled with large boulders was a jungle of tangled old-growth vegetation and flood swept timbers. I was constantly swinging my wood walking staff in front of me to beat open a path through all of the dead branches and limbs along the canyon bottom. If things weren't bad enough, to my shocked amazement there were beavers along the creek that had dropped many large diameter trees, making navigation of the canyon bottom even worse than it already was. Beavers in the desert? Where is this place again?! For the next messy part, shortly up the canyon you will come across a mandatory wading segment with sheer rock faces on both sides. There's no way around it, however the water at its deepest part was only about thirty inches. After coming this far, I was not about to turn around just when things were getting good. While working my way up the canyon I could not help but be impressed with the severity and height of the intricate cliffs and ledges that towered above the canyon bottom. The creek was a beautiful emerald green color with nice small waterfalls along the route. After about one mile, you will come across a wide area in the canyon just after an obvious bend that is a good turn around point (Lat. 33 degrees/35'/49.54"/N & Long. 110 degrees/54'/45.17"/W). 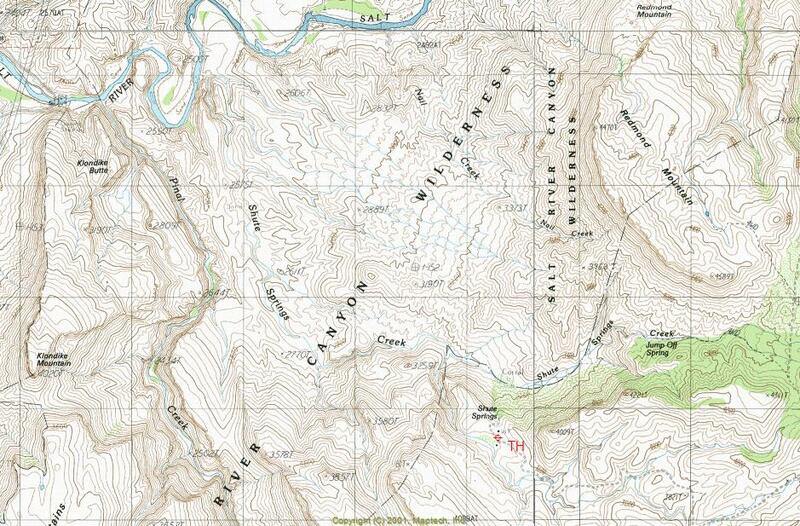 See maps for locations of waypoints described in the text. Hiking into Pinal Creek Canyon is truly an adventure. The feeling of remote isolation and solitude is unmistakable. Just driving to this remote area is an experience in itself. I have a great personal love for the Salt River Canyon Wilderness. This is a special location that very few people have experienced. The hike is very diverse and has something to offer from start to finish. If you're looking for a unique backcountry hike, you have found it. Count on having it all to yourself if you go. From Mesa Arizona take Highway US 60 to Miami. Turn left at Highway 188 to Roosevelt Lake. Travel 4.5 miles north. The first 4.5 miles of highway 188 have two northbound lanes and two southbound lanes. Stay in the right lane while traveling north. The right lane ends at Wheatfields Road, which is where you will be exiting. Travel northwest on Wheatfields Road while paralleling highway 188 for 1.7 miles through a residential area. At 1.7 miles there is an abandoned slump-block building. Turn right at the slump-block building onto Hicks Road, which will soon go over a bridge crossing Pinal Creek. Pinal Creek is a wide sand wash. Once across the bridge, travel northwest on Hicks Road paralleling Pinal Creek for 2.3 miles to FR219 (Lat. 33 degrees/31'/24.10"/N & Long. 110 degrees/51'/45.60"/W). Just before reaching FR219 you will drive past a large well kept horse ranch on your left. At the beginning of FR219 there is a gate with a "Private Land Access Sign-In Book". FR219 is in a large sand wash. You will be driving through private land for about one mile. The private land ends at a cattle guard in the sand wash. Drive northeast on FR219 from the gate for approximately 5.5 miles to FR223. The sign will say "Shute Springs". Drive northwest on FR223 for approximately 2.5 miles. At that point you will reach a fork where FR223 turns southwest to Shute Springs. The road than continues going straight is FR644. Do not take FR644. From the fork, continue driving on FR223 for approximately 3.0 miles to the trailhead.